Presenter: We're in a pub in Cambridge, and there are lots of people, mostly young people, sitting around - somebody's eating a hamburger. There's a young woman over there with what looks like the head of a polar bear on her lap - rather beautiful white polar bear… no, it's not a polar bear, it's a white wolf, with blue tongue, and pink ears, and the mouth opens and closes. And there are some big white furry paws on the table, and some brown paws… there's a squirrel at the end of the tail with red ears and a red tail, eating a toasted sandwich. Voiceover: That's Lalia; or at least, that's her squirrel name. Voiceover: I've found the furries – a shy part-human, part-animal tribe, who get together in small groups and large conventions to play, and to express their animal fursonas. There are hundreds of thousands of them out there, but they're mostly hidden in the undergrowth of the Internet. Presenter: …chicken! Eating a chicken sandwich - not acorns. Lalia: *laughs* – No, oh no, chicken. Presenter: And how is your squirrel fursona different from your everyday human identity? Lalia: I'm hyperactive, she's hyperactive – she's a little cuter than me, I should say. Voiceover: To outsiders, they might seem a little eccentric; but what they're doing is actually very familiar - using masks as a way to grease the social wheels. Harlequeen: I'm Harlequeen, I'm a long-time furry. *laughs* […] When we live with animals or be with animals, we have to give them human characteristics to learn about them; and we extend that even further, we fantasize - basically, if these wolves could talk, or if these deer could talk, and mummy deer is talking to Bambi, what would she say? And these are all anthropomorphizations; it's all this idea that you can extend and understand animals… and have fun with it! It is in the end about having fun. Voiceover: The furries are projecting human qualities onto animals. That's what that chewy word, anthropomorphism, means. They're also claiming animal characteristics for themselves. People all over the world have been doing that, since we made the first cave paintings. Harriet: The development of pet-keeping, as a very common, middle-class and even more widely-distributed habit, is something that happens in the course of the 19th century; if you look at the dog-breeding periodical of the late 19th century (as well as later; but say, in the Victorian period, when it was all just getting started), you find that announcements of arrangement to mate - stud arrangements - were put under the headings of engagements and marriages. Voiceover: Bella Williams is a neuroscientist who works for the charity Understanding Animal Research. Is there an evolutionary reason for our habit of giving other animals a human face? Bella: I'm not sure, in terms of evolution. I guess it would come down to something around people reading feelings into each other; so it would be something around the connection with empathy, with being able to understand other people – the way other people are thinking, you look at their behaviour and you interpret what their thoughts might be. So, the logical extension of that is that when you look at an animal, or when you look at something else which is exhibiting human-like behaviours, then you would interpret their thoughts; but you'd interpret them in a human-like way. Presenter: You don't think there's a… perhaps a survival aspect to it, like if you're running away from the lion, you might want to have some idea of what you think the lion's going to do, and what its intentions might be? Bella: But you might be wrong – and that's the difficulty with anthropomorphism, is that you're projecting your thoughts onto something else, without understanding theirs. Nuka often gets media queries based on his furry research efforts. The Wednesday before the meet, he forwarded my details to Maria - partly on the grounds that I was in the UK, and might know who else to talk to. We had a thirty-five minute chat on Thursday and she asked me to help them find a furmeet. The catch? Due to deadlines, it had to be that weekend. The largest event was the Birmingham Furmeet, but they don't want to talk to the media (nor do the LondonFurs, whose meet would've been too late anyway). 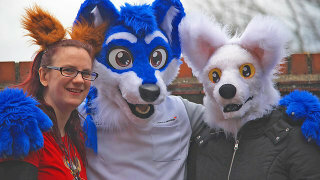 I pinned my hopes on the Cambridge Furs, and posted a request to the event's Facebook page. The response was very positive, and event organizer Chibs/Basil went the extra mile to ensure the pub venue was OK with it, too. As a bonus, Cambridge was close enough for me to drop by. The meet revolved around board and card games; we had a few rounds of Uno before the team arrived. The producer swiftly brought out a microphone and a chunky recording brick (which ate batteries), and they were off! Interesting to watch, especially with the presenter doing her best to describe the ears, tails and partials to the invisible audience. The reporters could only stay an hour or so – they had to record another segment on a farm – but in that time they got plenty of material. Naturally, we'll only hear a few minutes of this in the final show, but I guess a more-detailed follow-up is possible, if what's there plays well. It can't have been too bad, considering we got top billing; they even added that group photo as a cover image. I always want to laugh when science-y types approach fantasy and imagination from a serious mature adult scientific academic perspective. That's not how it works, people. You're missing the point.